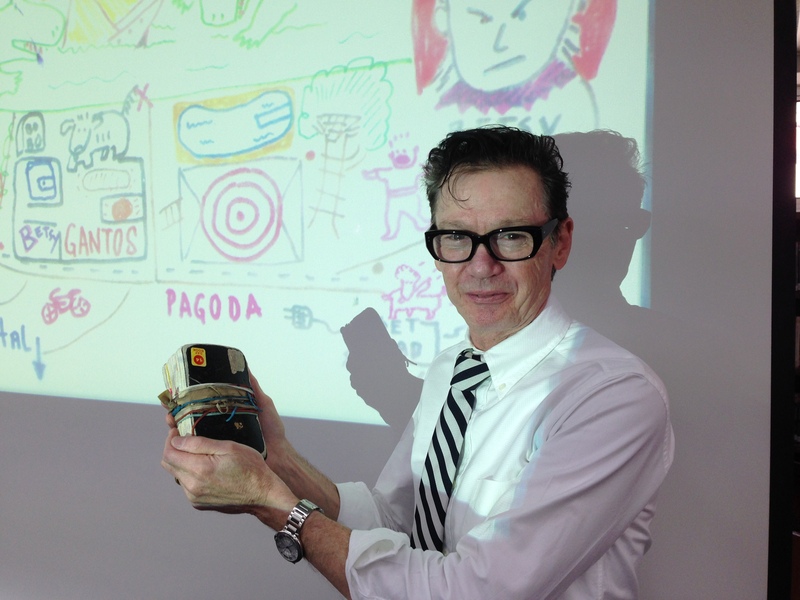 Today, if I kept a diary, I would have written: American author Jack Gantos came to our school today. He talked about writing and the power of words to convey images and feelings that allow us to enter the lives of others, to connect to others and to see our world differently. He told us to look and listen. He told us that we have so many stories within us- it’s just a matter of drawing them out, of shaping them and revising. Read stories aloud, weigh each word, cut the ‘waffle’, Gantos advised. We should open our eyes to the possibilities around us, map out our house, our neighbourhood and annotate these with statements of where various incidents in our life occurred: the hedge we leapt over while attempting the short cut home for dinner, the spot where we fell down the stairs in the race to answer the phone and broke our foot, the tree house our father helped us build and where the baby ducks were killed by a vicious kookaburra -all should be marked. Overheard conversations become fodder for our journals, the raw material to draw on later. Gantos inspired us to snoop, to listen, to absorb, to look,to remember, to record in sketches and words and to do this daily for 10-15 minutes. This is then the raw stuff of stories. Jack Gantos invited his audience of delighted seventh graders into his world, his seventh grade life so that we all felt as if we were there with him. He inspired and rekindled dormant memories of our past through his past, small fragments from our life journey. Jack Gantos with his journal in front of map marked with significant incidents of his childhood. These recorded conversations above reflect the morphological and etymological understandings of these students. Both girls are comfortable with the process of inquiry: hypothesising, confirming their initial hypothesis with evidence, using resources to confirm or inform, making further refinements to their hypothesis. They question and are happy to hold something as a hypothesis until they have further evidence. These video clips indicate their knowledge of morphemes- their recognition that <-al> may be a suffix but may also be part of the base. It depends on evidence. The clips also show these students are comfortable using resources to locate information about the root, and how they work through this carefully. They don’t just glom onto the first word in the etymology entry to state this is the root, ‘case closed’. Rather, they realize that their reading of the etymological entry is a “journey” through time, all part of a word’s story. It is always interesting to meet the other members of the family- the words that share the same base element or the words that share a different base element but come from the same root. Using this information and indicating it in the elegant concision of a matrix can generate more questions about suffixes and bases which reinforces and extends our knowledge of the morphological structure of words. Journal- The Story: it’s all in a day’s work. ‘Journal’ is attested first in English in the mid 14th century from Anglo-French evolving from an Old French word ‘jornal’ which came from a Latin etymon ‘diurnalis’ meaning daily. When it was first used in English it referred to daily accounts and inventories. It only became associated with the idea of a personal journal from 1600 in French. It was another one hundred and twenty eight years later that it took on an additional sense of daily publication. As you heard in the video clips Nikki immediately wondered about ‘journey’. She had seen the similarity in letters but rather than assume a relationship, she began to question the possibility of a shared base and the existence of the suffix <-ey>. The sense of ‘diary’ as a book where daily events are recorded was first attested in Ben Jonson’s Volpone (1607):iv. i. 133 ‘This is my Diary, Wherein I note my actions of the day.’ Prior to this, a diary referred to ‘daily allowance’ in the 1580’s from Latin diarium, dies. Ayto refers to ‘diary’ and ‘journal’ as ‘semantic cousins’, different bases, same root. 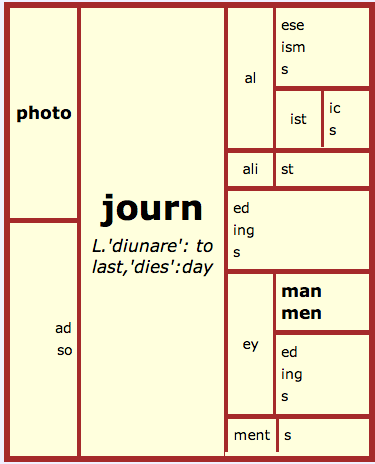 Below is the matrix Nikki created to show her understanding of the word ‘diary’ a bound base from Latin dies day. 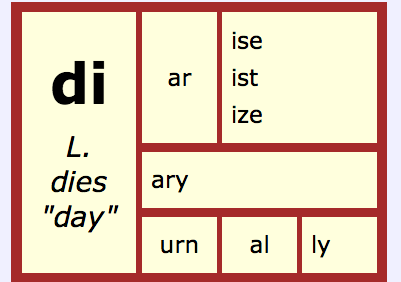 We hesitated over the analyisis of Latin suffix <-urn>. Should it be <-urnal> or <urn+al>? We recorded it as two morphemes as we could find evidence of <-al> as an adjectival suffix in many words: global, final. The word journal is the older of both words in English but the sense of a place to record personal events in both journal and diary, seemed to occur at the same time in the 1600s. However, ‘journal’ is the broader of the two terms covering written publications collected together while diary is narrower referring to the specific daily recordings of a person. Watch below the footage shot by the Bakers, Americans in Vienna during these turbulent times, listen to excerpts from Helen’s diary. ‘ This ration is much worse than the previous one. Terrible hunger is awaiting us again. I got the vegetable ration right away. There is only vinegar and ice in the beets. There is no food, we are going to starve to death. All my teeth ache and I am very hungry. My left leg is frostbitten. I ate almost all the honey. What have I done? I’m so selfish. What are they going to put on their bread now, what will they say? Mom, I’m unworthy of you. You work so hard. Besides working in the workshop, mom looks awful, like a shadow. She works very hard. When I wake up at twelve or one o’clock at night, I see her exhaustedly struggling to keep working at the sewing machine. And she gets up at six in the morning. I must have a heart of stone. I’m ruthless. I eat everything I can lay my hands on’. Go here to read about the remarkable Oneg Shabat archive an underground archive established and run by historian Dr. Emanuel Ringelblum who with his secret group, documented life under Nazi occupation in Warsaw. Ringelblum collected artefacts from letters, diaries, drawings to government documents. 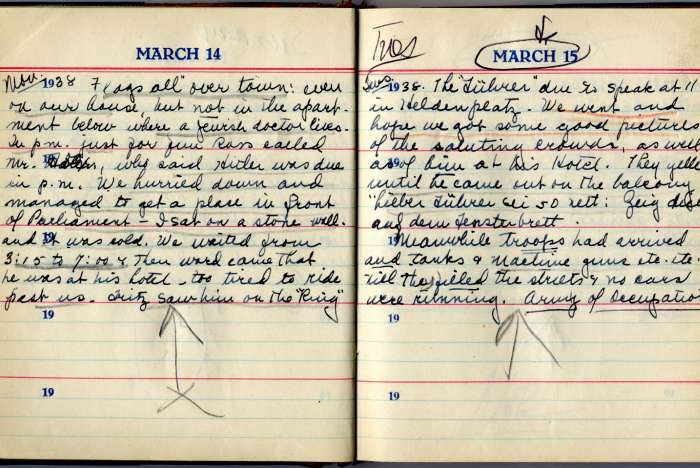 He collected information during the day, and wrote notes at night aware that what was happening to the Jews was unprecedented. The Oneg Shabbat materials were preserved in three milk cans. One uncovered in 1946 and another in 1950; the other has yet to be located. Diaries and journals, the recording of days, that over time grow from a personal record to testimony that bears witness and helps us to face our past. Read BBC Warsaw Ghetto: The story of it’s secret archive.